Were you like many along the Seacoast this past Fall raking up the leaves? Did it never seem to end with bag after bag of filled to the brim? And have you noticed lately a pain developing on the outside of your elbow? You’ll likely experience the same when shoveling snow. Well that my friend, is mostly likely lateral epicondylitis or tennis elbow. Well then what is this lateral epicondylitis exactly? 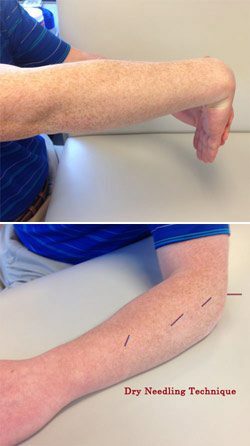 Lateral epicondylitis is an inflammation of the connective tissue of the wrist extensors in the forearm. It is an ailment that is accounted for in 1-3% of the population with primary occurrence noted between 30-50 years, of age. Repeated overuse and strain on the muscles in our forearm pull on the connection at the elbow causing tearing of the tissue and increased inflammation. Like many, symptoms don’t often become noticeable until weeks or even months after the damage has been done to the tissue and can persist upwards of 2 years if left untreated! So what can you do about it? If you first start to notice an increase in pain in the elbow stop or limit the activity that is causing an increase in your pain. Give your arm time to heal and use ice to control the pain/discomfort. You can also wear an elbow brace that wraps around your forearm sold at many local pharmacies to also help manage your symptoms by decreasing the strain on the tendons of the joint. In terms of ice vs heat, you want to avoid sources of warmth as these will increase your symptoms whereas ice will help diminish the pain. A simple forearm extensor stretch can help manage your early symptoms holding for 30 seconds performing 2-3 times per day, but it is best to seek treatment as early as possible. And what if your symptoms are too severe? Well, all of the Physical Therapists at Hampton Physical Therapy have extensive knowledge in the identification and treatment of lateral epicondylitis. Each therapist have been trained using the latest techniques including Trigger Point Dry Needling, Graston Technique™, and neural mobilizations to get you back and ready for the coming snow this Winter. We have both offices in Seabrook and Hampton and look forward to working with you! If you need further information or questions we can gladly assist you at www.Hamptonpt.com. Bisset, Leanne et. al. Mobilisation with movement and exercise, corticosteroid injection, or wait and see for tennis elbow: randomized trial. British Medical Journal, 333(7575): 939. 2006 Nov 4.